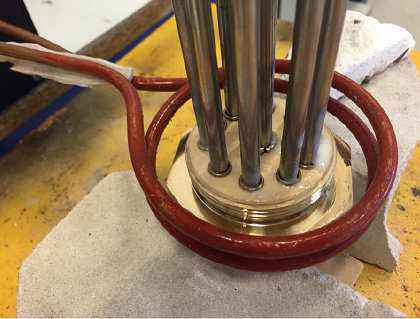 A Swedish manufacturer of heating & cooling devices requested Ambrell to braze an immersion heating element. The manufacturer was evaluating implementing Ambrell induction into its production process. The application involved brazing stainless steel elements to a brass body. Ambrell’s EKOHEAT 45 kW power supply with a custom-made two turn helical induction coil assured the application’s efficiency and effectiveness. The heating time was only 30 seconds. The customer was delighted with Ambrell’s best-in-class lab service and the timely, extensive test report and system recommendation it received at the end of lab testing. The proposed induction brazing solution fulfilled client's requests. The system was sold, and is going to be implemented in the Swedish factory. Ambrell offers remarkable brazing expertise based on over 30 years industry experience. We are exhibiting at trade shows and speaking at brazing conferences on a regular basis. Check our event agenda and visit us during an upcoming event in your area. We also encourage you to fill out a lab service request form so that we can test your application and recommend an optimal induction heating solution.Or read more about our brazing solutions in our rich application notes library!